JR Chuo Sobu Line (中央線・総武線) to Suidobashi Station (水道橋駅). Be careful about which train line you get on. You will want to be the the JR Chuo Sobu line that is yellow in color and not the JR Chuo line that is orange. The orange train will pass, but not stop at Suidobashi Station. You can exit Suidobashi station using either the East or West exit. Both will get you to the Dome. Subway Mita Line (三田線) to Suidobashi Station (水道橋駅). This is not the same station as the JR Suidobashi station. You can take any of exits A2-A5 to get to the Dome. There are other ways, but those are the 2 best methods to get to the Dome via train. You can find a very detailed seating chart for the Tokyo Venue here. The Arena section would be in the area where the baseball diamond is. No one knows what the Arena setup will be until the concerts starts. Usually, the main stage is setup along the outfield with the Arena A section being closest to the main stage, then Arena B, then Arena C, etc. Gates in the 20s are the first floor stands, gates in the 30s are the balcony, and gates in the 40s are the 2nd floor stands. JR Yamanote Line (山手線) to Harajuku Station (原宿駅). The JR Yamanote line is green and one of the most well-used train lines in all of Tokyo. To get to the Gymnasium, take the Omotesando exit. Walk straight out of the exit until you reach a large bridge. Turn right and cross the bridge toward the entrance to the Meji Jingu Shrine. Once you cross the bridge, turn left and follow the side walk to the next traffic light. You should be able to see the Gymnasium from the traffic light. Cross the road using the pedestrian overpasses to get to the venue. Subway Tokyo Metro Chiyoda Line (東京メトロ千代田線) to Meiji Jingu Mae Station (明治神宮前駅). Take Exit 1 and head towards the pedestrian overpasses. From the top of the overpass, you should be able to see the gymnasium. 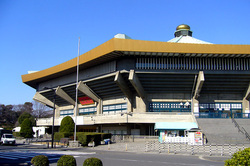 The Yoyogi Gymnasium is in a excellent location for Johnny's fans. In the same area as the venue are a variety of idol shops selling both official and unofficial goods. The official Johnny's shop is also right across the street (though concert weekends are not the best time to visit as the shop will be very busy)! You can find a seating chart for the Yoyogi Gymnasium here. The Arena section is located in the purple area. Usually, the main stage is normally setup in the center of the purple area or to the A stand section side of the purple area. JR Chuo Sobu Line (中央線・総武線) to Sendagaya Station (千駄ヶ谷駅 ) or Shinanomachi Station ( 信濃町駅). It takes about 5 minutes to walk to Kokuritsu from either station. Subway Toei Oedo Line (都営大江戸線) to Kokuritsu-Kyogijo Station (国立競技場駅). This is the closest station to the venue. Kokuritsu is about a 1 minute walk away. 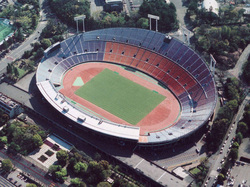 Kokuritsu is a huge venue that is normally used for soccer and other sporting events. Concerts are rarely held here. It is considered an honor to preform a concert at this venue. Arashi usually holds a concert hear every year. Tickets for the Kokuritsu show are very highly sought after. You can find a seating chart for Kokuritsu here. The Arena Section would be where the track and field are. The main stage is normally setup along the pink sections 1-8. Subway Toei Shinjuku Line (都営地下鉄新宿線) or Subway Hanzomon Line (東京地下鉄半蔵門線) to Kudanshita Station (九段下駅). It takes about 2 minutes to walk to Budokan from the station. This venue is normally used for martial arts events, but holds the occasional concert. A seating chart for Nippon Budokan can be found here. Subway Mita Line(都営地下鉄三田線), Chiyoda Line (東京地下鉄千代田線), or Hibiya Line (東京地下鉄日比谷線) to Hibiya Station (日比谷駅). Take exit B3. The Imperial Theater will be less than a minutes walk away. JR Yurakucho Line (有楽町線) to Yurakucho Station (有楽町駅). Take the International Forum exit. The Imperial Theater is about a 5 minute walk away. 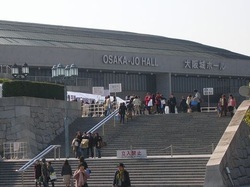 This is one of the most common venues for stage plays. 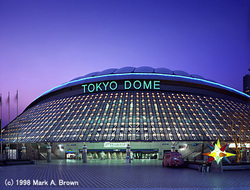 It is where Shock and Dreamboys are annually held. The seating chart for the Imperial Theater can be found here. There are little shops inside the venue selling food, magazines, and other items. You can also buy or rent binoculars. Goods are only sold inside the venue. You do not need a ticket to buy most goods, however there will only be certain times that people without tickets can go inside. JR Yamanote Line (山手線) to Shin-Okubo Station (新大久保駅). The Globe Theater is about a 5 minute walk from the station. 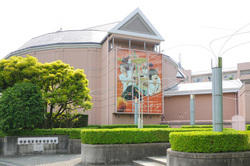 This is another common stage play venue. It is the smallest of the regular stage play venues and creates and nice, intimate atmosphere. You can find the seating chart here. The main page shows the 1st floor (which is ground level). Click on the buttons at the top of the page to see levels 2 and 3. I do not recommend the 3rd level at this venue. There is a small cafe inside that sells food and drinks. JR Yokohama Line (横浜線) or Tōkaidō Shinkansen (東海道新幹) to Shin-Yokohama Station (新横浜駅). The Yokohama Arena is about a 7 minute walk from the station. Yokohama Municipal Subway Blue Line (ブルーライン) to Shin-Yokohama Station (新横浜駅). The Yokohama Arena is about a 7 minute walk from the station. The Yokohama Arena, while not in Tokyo, is fairly close. The seating chart for the venue can be found here. Please note that the seating terminology for the Yokohama Arena is not the same as other venues. 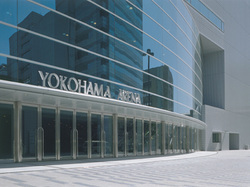 The area that would be called Arena at other venues is called Center at the Yokohama Arena. The first floor stands are called the Arena (labeled as A-F on the seating chart). And the last few rows in the back are called the Stands (marked as North, South, East, and West). This is one of the few venues that usually sells goods both outside and inside the venue. Goods sold inside can only be bought by those with a ticket. Buying goods inside the venue is a great way to avoid waiting in the long line outside, but try to enter the building early as the lines inside will be fairly long as well! Osaka Municipal Subway Nagahori Tsuriumi-ryokuchi Line (長堀鶴見緑地線) to Dome-mae Chiyozaki Station (ドーム前千代崎). The Kyocera Dome is about 1 minute away. Hanshin Railway Hanshin Namba (阪神なんば線) Line to Dome-mae Station (ドーム前). The Kyocera Dome is about 1 minute away. JR West Osaka Loop Line (大阪環状線) to Taisho Station (大正駅). 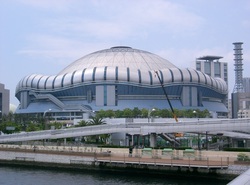 The Kyocera Dome is about a 7 minute walk away. Nagahori Tsurumiryokuchi Line (地下鉄長堀鶴見緑地線) to Osaka Business Park Station (大阪ビジネスパーク駅). The Hall is about a 5 minute walk from the station. JR Osaka Loop Line (大阪環状線) to Osaka Jo Koen Station (大阪城公園駅). The Hall is about a 5 minute walk from the station. The seating chart for Osaka Jo Hall can be found here. Want to get information on a venue you don't see listed above? Please contact me and I will add it to the list!